VNIT | Project Assistant | Govt. Jobs | Last Date: 20 April, 2014. Visvesvaraya National Institute of Technology, Nagpur is one of the thirty National Institutes of Technology in the country. The Govt. of India conferred on the Institute, the Deemed to be University status (under University Grants Commission Act, 1956 (3 of 1956)) with effect from 26th June 2002. Posted in Civil, Job After Btech, Project Associate, With experience, Without Experience. Tags: 2014., Govt. jobs, Last Date: 20 April, VNIT openings, VNIT Project Assistant on April 2, 2014 by kavita joshi. EIL Engineers India Limited | Govt. Jobs | Special Recruitment for OBC | Last Date: 20 April, 2012 | Apply Online. BE/ BTECH (Mechanical) required in Engineers India Limited, New Delhi. Posted in Apply online, Job After Btech, Mechanical, With experience. 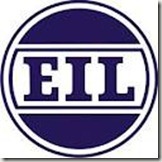 Tags: 2012, Apply online, EIL, ENGINEERS INDIA LIMITED, Govt. jobs, Last Date: 20 April, OBC, special recruitment on April 2, 2012 by kavita joshi.